In 2013 Ontario's demand was little changed, while prices for the electricity commodity in Ontario escalated about 16%. Analysing data from the year provides illustrations for many topics covered on this blog since inception: supply continues to grow while demand does not; excess generation is dumped on export markets far below the cost of supply to Ontarians, and the global adjustment pricing mechanism continues to become a greater component of the commodity charge even as it becomes clearer it's largely improvised each month. Most of the data I collect, and manipulate for reporting, comes from the Independent Electricity System Operator (IESO). That data reports "demand", but the term is used to mean the sum of supply on the IESO controlled grid; it does not reference actual metered demand. The IESO does not, and cannot, report supply embedded within the local distribution company (LDC) grids, which likely grew rapidly in 2013. The IESO is likely to report demand slightly down, but that is likely only true because there is no accounting for the growth in solar power, with all panels currently embedded in LDC areas; adjusting for the impact (which shows as lower demand), my estimates indicate the past 3 years experienced essentially the same demand/supply. The big story for most is the elimination of coal-fired generation in southern Ontario (it will remain briefly in Thunder Bay), but there are other stories that are as important to tell, including the closely related nuclear generation story. My research indicates coal-fired generation peaked in 2000 - the year of the lowest annual nuclear generation since 1991. In 2013 total generation on the IESO grid was similar to generation in 2000: coal-fired generation was down 39.3TWh, and nuclear up 30.8 (demand was down ~12TWh, and all of that energy became exports). All the growth in generation during 2013 was due to the reactors at Bruce A, 2 of which are freshly refurbished. All other reactor sites saw a decrease in 2013 - some of which is likely due to curtailment. The IESO's recent 18-month outlook indicated ~1,15 GWh of curtailment (Figure 6.1), and it's unlikely that would include periods where a reactor at Pickering, and possibly Darlington, would be offline because the grid could not accommodate it. I can't say if there were periods in 1994 where reactors were idled due to demand, so I'll just say 2013 looks to be the second highest production level Ontario's nuclear fleet has delivered - but it may be the best performance ever. The output from Ontario's hydroelectric generators improved in 2013, but probably not by as much as they were capable of. Ontario Power Generation (OPG) announced a major Niagara tunnel project completed on March 21, but the Niagara plant had growth, in 2013, far below average on a very wet year. OPG had claimed the project would, "increase the output from the Sir Adam Beck complex by 14%." It has not - whether that be due to a lack of need for the production, the role of the complex in maintaining the system's balance, poor forecasting, or other reasons is not known. It is notable that non-OPG assets, shown as "Other" in the table (likely contracted on a "must take" basis), hugely outperformed. Wind generation ended up producing as expected for 2013 - but due to an enormously windy November catching up for some poorer production months. In September the IESO implemented procedure changes facilitating the ability to curtail the output of industrial wind turbines when the grid was over-supplied. The only 3 wind sites producing less in 2013 than 2012 (annual totals) were Greenwich, Prince Farm and Underwood - 3 sites I've noted having been curtailed at times due to transmission constraints. Ontario is currently moving additional intermittent generation projects along for all 3 areas - projects that, if completed, will frequently necessitate paying suppliers to curtail supply. 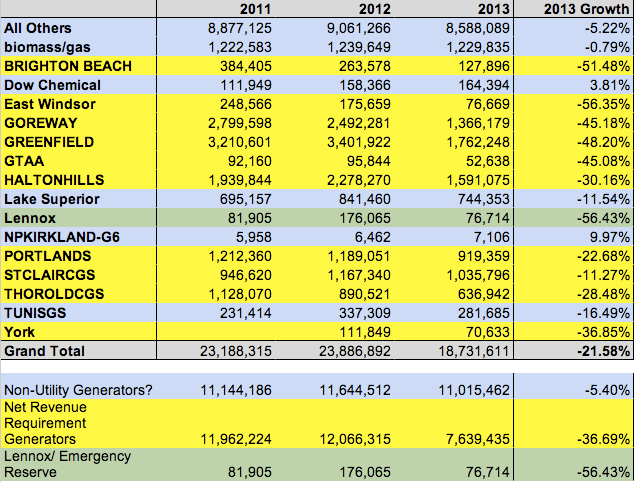 The Graphic to the right shows annual production for gas fueled generators (some are co-fired). The records highlighted in blue can be grouped together as must-run generators - expected to be Ontario's non-utility generators; these generate approximately 1200MW consistently throughout the year. I wrote about the group during 2013 in Wynne should right Duguid's wrong NUG directive. Lennox Generating Station acts like an emergency reserve in Ontario - at least it has as long as coal-fired generation was available. It is owned by OPG and kept operating through a capacity contract from the OPA. The generators highlighted in yellow are those with net revenue requirement contracts, which pay for their availability regardless of production. I've written about these often, including 2013's The Capacity Trap: Ontario's Electricity Costs Soar as Emissions Drop. It is not possible to understand Ontario's market pricing without addressing these generators - all contracted by Liberal government's since 2003. Pricing will be the topic of Part 2 of the annual review.